Harriet Beecher Stowe was an author and reformer. She is best known for her novel Uncle Tom's Cabin. 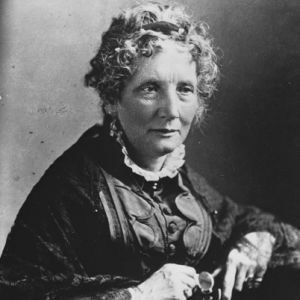 Harriet Beecher Stowe was born in Connecticut in 1811, the daughter of Reverend Lyman Beecher, a moral reformer and minister. In 1832 the family moved to Cincinnati, where Stowe saw slavery firsthand just across the Ohio River in Kentucky, and witnessed its effects on Cincinnati. Her experiences there had a lasting impression on her, as did her father's sense of morality and justice. Stowe was living in Maine in 1850, the year the Fugitive Slave Act was passed. In response to the Act, Stowe wrote Uncle Tom's Cabin (1852), a novel that exposed the cruelties of slavery and the moral hypocrisy of the legal, social and religious arguments of white slavery proponents. Despite the fact that Stowe clearly blamed the system of slavery, not slaveholders themselves, and did not proclaim herself an abolitionist, the book exacerbated the strained relationship between the North and South. Southern readers saw it as abolitionist propaganda while northern readers saw it as a compelling moral argument against slavery. President Lincoln, half-seriously, later attributed some responsibility for the Civil War to Stowe. Stowe continued to publish novels and regional fiction, including several on slavery, but none of her works garnered as much notoriety as Uncle Tom's Cabin.